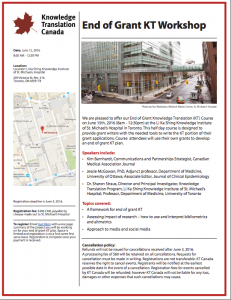 We are pleased to offer our End of Grant Knowledge Translation (KT) Course on June 15th, 2016 (8am - 12:30pm) at the Li Ka Shing Knowledge Institute of St. Michael’s Hospital in Toronto. This half day course is designed to provide grant writers with the needed tools to write the KT portion of their grant applications. Course attendees will use their own grants to develop an end of grant KT plan. To register email Gail Klein with a one page summary of the project you will be working on for your end of grant KT plan. Space is limited and registration is on a first come first serve basis. Registration is complete once your payment is received. Refunds will not be issued for cancellations received after June 3, 2016. A processing fee of $60 will be retained on all cancellations. Requests for cancellation must be made in writing. Registrations are not transferable. KT Canada reserves the right to cancel events. Registrants will be notified at the earliest possible date in the event of a cancellation. Registration fees for events cancelled by KT Canada will be refunded; however KT Canada will not be liable for any loss, damages or other expenses that such cancellations may cause.